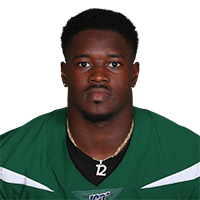 Published: Dec. 23, 2018 at 01:34 p.m.
New York Jets running back Elijah McGuire rushes for a 4-yard touchdown. Published: Dec. 15, 2018 at 09:05 p.m. Published: Dec. 9, 2018 at 04:18 p.m.
New York Jets running back Elijah McGuire rushes for a 1-yard touchdown.